What are the benefits of our PhysioscienceTM products? The 3D software analyzes an athletes movement patterns while participating in seven evidence based and sports specific tests. The software tracks all joints from the trunk to their toes in real time and allows for a very accurate analysis of an athletes strengths and weaknesses. The data collected from the tests are used by the clinician to create an individualized program to address the patients weaknesses with Doctors of Physical Therapy. After participating in the program, the patient will be retested by the software to track progress and perform a comparison of results. Our goal is to identify patients and athletes who have a high likelihood of an ACL tear, educate, help prevent injury and improve sports performance. Lumbar spine flexibility is very important in the work place especially for individuals who have careers in healthcare, construction, and parcel delivery services. Our software assess individuals lumbar spine flexibility and identifies who is at risk for a lower back injury. The data collected will be used by a clinician to create an individualized program to address the patients weaknesses, educate them on proper work specific body mechanics, and focus on injury prevention. Let us help keep you and your employees safe and injury free. The 3D software allows for a full body assessment from head to toe of an individual to establish strength and weaknesses of every joint with regard to all functional day to day movements. The software focuses on an individuals mobility, strength, motor control, coordination, balance, and proprioception. Based on the results a clinician will establish an individualized program to improve posture with daily activities and sports specific movements, education on strengths and weaknesses, and allow for periodic software analysis reassessments to track progress. Once tested with one of our PhysioscienceTM products… How do we analyze the results? 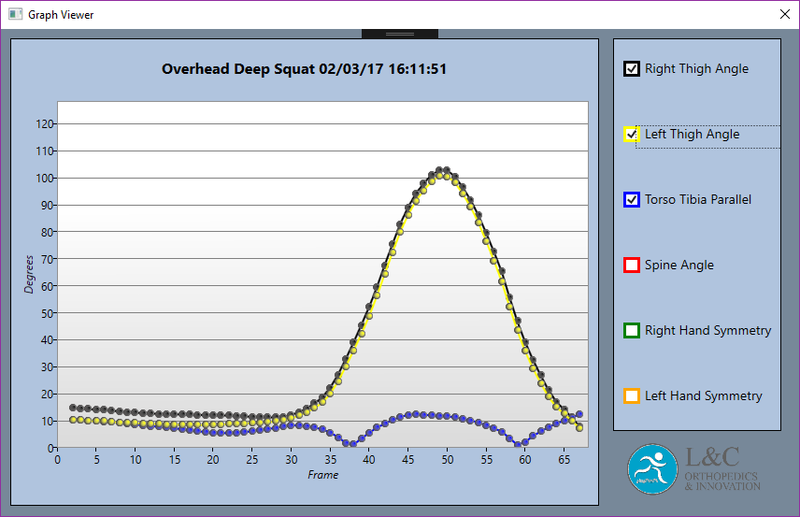 Once tested with one of our PhysioscienceTM products each individual will be given real time results in multiple ways. Our software develops a report card that computes an overall performance grade, summarizes strengths, weaknesses, identifies risk of injury and a summary of recommendations/exercises for each person. The report card helps to improve how the individual moves/functions to track progress, prevent injury, improve sports performance and overall quality of life. Our software analyzes the results in a variety of ways which includes a table, graph, and a frame viewer platform. 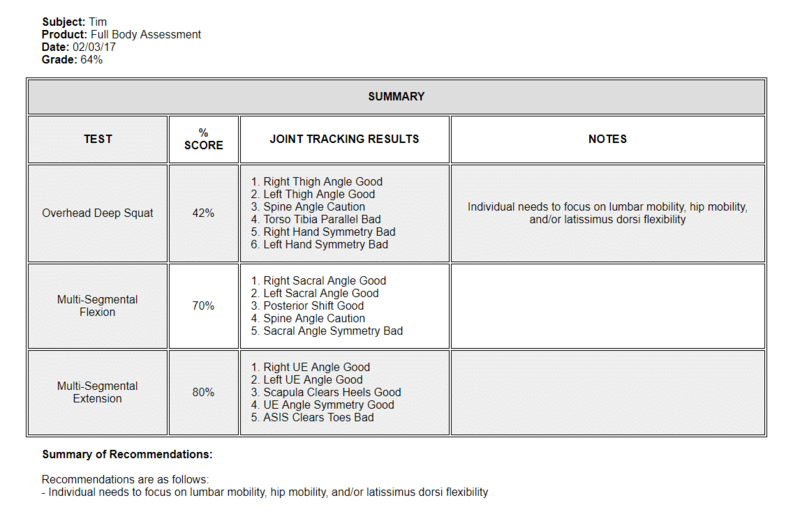 The table breaks down the min and max angles of all the joints tested and report if the individual falls into a good, warning or bad range to help identify strength and weaknesses to prevent injury, improve quality of life and sports performance. To make it clear for anyone using the software, the “good” range is signified by a green thumbs up, the “warning” range is a yellow thumb sideways, and the “bad” range is a red thumb down. 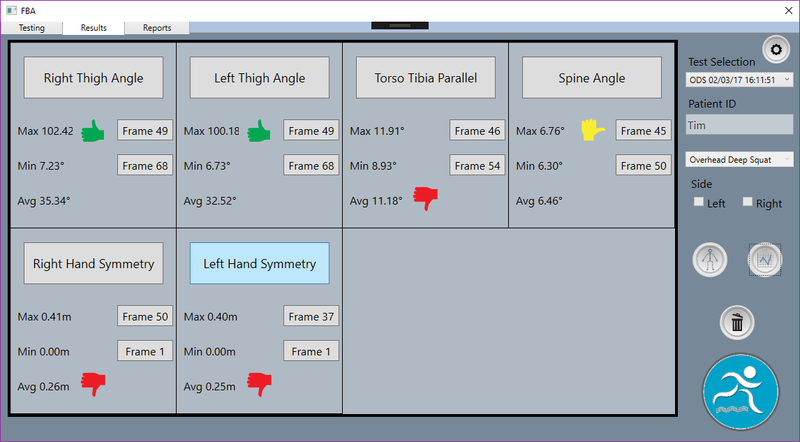 The graph will allow individuals to compare and contrast multiple joints at the same time through out the movement pattern to identify imbalances, similarities, differences, etc among multiple joints after the real time 3D analysis is complete. Each joint is pictured with a different color to make it easy and very user friendly to be able to compare and contrast different joints at the same time. 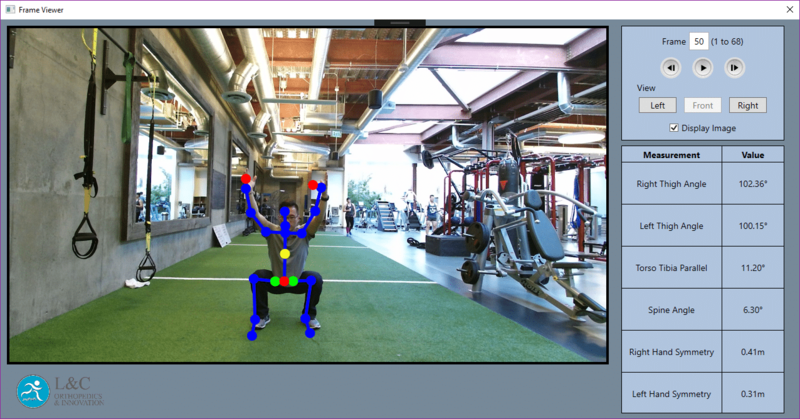 The frame viewer allows individuals to watch the real time video captured by our software for each test to analyze the movement frame by frame. Blue dots overlay each joint of the person through out the video and change colors to either green, yellow or red to help identify risk of injury, strengths, weaknesses, and assist with education to prevent injury, improve sports performance and overall quality of life.